Liam’s Northern Ireland under-21 record cap haul could live forever! Motherwell defender Liam Donnelly has spoken of his pride at becoming Northern Ireland under-21s’ record cap holder of all time. Donnelly – who played for ’Well in Saturday’s 1-1 home draw against Livingston – achieved the remarkable landmark when winning his 22nd cap in a home European qualifier against Spain last month. And the Green and White Army kids still have a chance of qualifying. “That was a great achievement,” 22-year-old defender Donnelly told the Motherwell Times. “It was something that I’ve been aiming to do from the start of the campaign. “I knew it was possible and it’s an honour and one that I’m proud of. “There’s two more qualifying games left. “Depending on the manager’s selection, hopefully I’ll play at least in both of them. “And if we win both hopefully we can maybe be in with a chance of qualifying for a play-off to get into the finals. Donnelly – who is bossed at international level by former Steelmen gaffer Ian Baraclough – didn’t think referee Willie Collum should have sent off ’Well’s Carl McHugh for two relatively soft fouls in the draw against Livi. “I thought the red card was very harsh,” the ex-Hartlepool United man added. “Carl said he got a touch on the ball as well. “It’s tough. I think they (Livi) had a few challenges, a few of their players went in and could have easily had the same outcome before that. “You would like the same for both teams but it’s how the referee sees it at the time. “The Livi boy Menga committed at least three or four fouls before he even got a yellow. “It’s the referee’s decision. I’m not going to stand here and make too many complaints but I’m sure Carl and ourselves are disappointed with the red card. At least Saturday’s draw ended a miserable run of four consecutive defeats in league and cup for the Steelmen. “I think that was the main thing we were looking to take out of the game today,” Donnelly added. “I’m sure it wasn’t a nice game to watch for some people. “I think you can see when the fans are getting frustrated. “I know there was a bit of an atmosphere and I could see why. “But we’ve stopped that run and that’s what we set out to do. We knew we had to come away with at least a point and we did that. “So there are some positives to take from it and hopefully we can kick on from that and it gives us a base to start from. 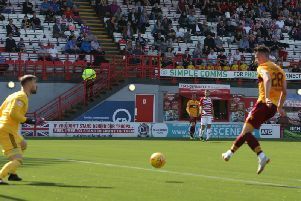 And it would have been three points for Motherwell had it not been for a stunning second half free-kick into the postage stamp corner by Livi’s Keaghan Jacobs. “It was a great free-kick from him to be fair,” Donnelly added. “But it’s disappointing as well because I think it was their only shot on target. One positive from the last couple of games has been the return of the partnership of Ryan Bowman (who scored the opener against Livi with a low 17th minute shot from Allan Campbell’s pass) and Curtis Main. “In the last two games the two of them have been bang on it again,” Donnelly said. “I know from having seen stuff from last season they caused a lot of teams trouble last year. With the international break this weekend – including Donnelly’s Northern Ireland under-21s playing against Iceland and Slovakia – Motherwell won’t be in competitive action again until a home league game against St Johnstone on Saturday, October 20. “I’ll be away this week,” Donnelly said. “I’m sure a few of the lads will be in working hard. “They might have a day or two off maybe next weekend. “But after that everybody will be straight back in fully focussed and working hard to make sure we get a result against St Johnstone. “Of course there’s still a belief we can get top six this year. “It’s still early doors. Some of the performances early on in the season have been decent. “Sometimes we haven’t had the rub of the green. “We’ve maybe lacked a killer instinct or finishing our chances, some things have gone against us.